Constraints are anything that limits a system from achieving higher performance. On the highway, accidents that prevent you from driving 65 miles per hour to work in the morning are constraints. Constraints can occur in any process, whether in manufacturing or service industries. In a manufacturing plant, constraints slow down assembly line production, gumming up the works so that you can’t produce as many units as you need. Department 1 buys piglets, the direct materials. Department 2 feeds and grows the piglets over a 12-month period. Department 3 slaughters the pigs. Department 4 processes the carcasses. Department 5 then cans the buttocks to make ham. Finally, Department 6 cooks the canned ham, resulting in finished goods inventory. The figure enumerates how many units of production each department can process during a single day. Pam’s constraint is in Department 4, which can only handle 45 units per day. This constraint limits Pam’s entire production capacity to just 45 units per day. All the additional capacity in the other departments is completely wasted as a result; the fact that Department 2 has enough employees, space, and equipment to grow 100 units a day or that Department 5 is capable of canning 120 units of pork per day doesn’t matter. Department 4 slows every department down to just 45 units per day. The constraint phenomenon isn’t limited to manufacturers — it can also occur in service businesses. For example, consider a surgeon’s office, where every patient must go through certain steps before and after surgery. 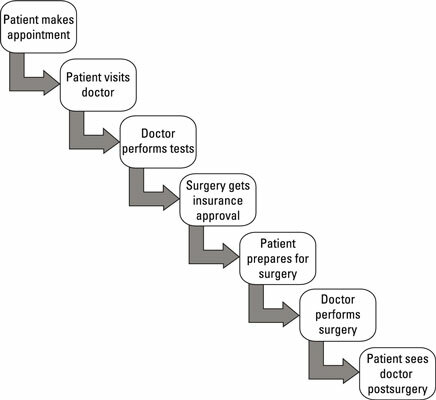 In order to maximize the chance of a successful surgical procedure, each patient needs to go through a series of steps. The process starts when the patient makes his first appointment with the doctor. After this visit, the doctor orders a series of tests, reviewing the results. If the doctor deems surgery necessary, her office seeks the approval of the patient’s insurance company. Next, the patient is prepared for surgery. Following the surgery, each patient needs a post-op visit. Here, constraints can actually risk the health of patients. For example, if the doctor can only handle a limited number of patient visits per week, then every step that requires the doctor’s involvement is slowed down, or constrained. Delays in obtaining insurance company approval have a similar effect. In order to meet patient needs, managers in the doctor’s office need to carefully manage these steps. Other service companies have similar processes to manage.